This set of Civil Engineering Drawing Multiple Choice Questions & Answers (MCQs) focuses on “Brickwork, Woodwork and Stone Masonry”. 1. The craft of _______________involves creating buildings, structures, and sculpture using stone from the earth. Explanation: It is one of the oldest trades in human history. These materials have been used to construct many of the long-lasting, ancient monuments, artifacts, cathedrals, and cities in a wide variety of cultures. Famous works of stonemasonry include the Taj Mahal, Cusco’s Incan Wall, Easter Island’s statues, the Egyptian Pyramids, Angkor Wat, Borobudur, Tihuanaco, Tenochtitlan, Persepolis, the Parthenon, Stonehenge, and Chartres Cathedral. 2. ______________are workshop-based, and specialize in working the stones into the shapes required by a building’s design, this set out on templets and a bed mould. Explanation: They can produce anything from stones with simple chamfers to tracery windows, detailed mouldings and the more classical architectural building masonry. When working a stone from a sawn block, the mason ensures that the stone is bedded in the right way, so the finished work sits in the building in the same orientation as it was formed on the ground. 3. ____________specialize in the fixing of stones onto buildings, using lifting tackle, and traditional lime mortars and grouts. Explanation: Sometimes modern cements, mastics and epoxy resins are used, usually on specialist applications such as stone cladding. Metal fixings, from simple dowels and cramps to specialised single application fixings, are also used. The precise tolerances necessary make this a highly skilled job. Explanation: Sandstone is a clastic sedimentary rock composed mainly of sand-sized (0.0625 to 2 mm) mineral particles or rock fragments. Most sandstone is composed of quartz or feldspar because they are the most resistant minerals to weathering processes at the Earth’s surface, as seen in Bowen’s reaction series. 5. _____________is used as a protective and decorative covering for interior or exterior walls and surfaces. Explanation: Stone veneer can be made from natural stone as well as manufactured stone. Natural stone veneer is made from real stone that is either collected, i.e. fieldstone, or quarried. The stone is cut to a consistent thickness and weight for use as a veneer. 6. The basic tools for shaping the stone are a mallet, _________, and a metal straight edge. Explanation: Chisels come in a variety of sizes and shapes, dependent upon the function for which they are being used and have many different names depending on locality. There are different chisels for different materials and sizes of material being worked, for removing large amounts of material and for putting a fine finish on the stone. Explanation: Filling in the gaps (joints) with mortar is referred to as pointing. Pointing in smaller joints can be accomplished using tuck pointers, pointing trowels, and margin trowels, among other tools. Explanation: Header bond is often used on curving walls with a small radius of curvature. In Lewes, Sussex, England UK many small buildings are constructed in this bond, using blue coloured bricks and vitrified surfaces. 9. Which type of bond is shown in the below figure? Explanation: The herringbone pattern made by placing soldiers next to stretchers or vice versa (i.e. headers perpendicular) making ‘L’ shapes, nesting each L in the same order of laying. Thin bricks are more common. 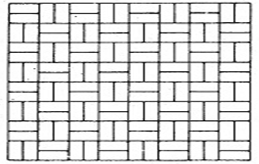 The pattern is usually rotated by 45° to create a completely vertical (plumb) succession of ‘V’ shapes. It follows either the left or right brick forms the tip of the v in any wall. Herringbone is sometimes used as infill in timber framed buildings. 10. _______________ is very hard wood and has a dark reddish brown color. It is fragrant and close grained. It is hard to work and takes high polish. Used in musical instruments, piano cases, tool handles, art projects, veneers and furniture? Explanation: All rosewoods are strong and heavy, taking an excellent polish, being suitable for guitars (the fretboards on electric and acoustic guitars often being made of rosewood), marimbas, recorders, turnery (billiard cues, fountain pens, black pieces in chess sets, etc. ), handles, furniture, and luxury flooring, etc. Rosewood oil, used in perfume, is extracted from the wood of Aniba rosaeodora, which is not related to the rosewoods used for lumber. 11. ____________is wood that as a result of a naturally occurring chemical transformation has become more resistant to decay. Explanation: Heartwood formation is a genetically programmed process that occurs spontaneously. Some uncertainty exists as to whether the wood dies during heartwood formation, as it can still chemically react to decay organisms, but only once. Heartwood is often visually distinct from the living sapwood, and can be distinguished in a cross-section where the boundary will tend to follow the growth rings. For example, it is sometimes much darker. 12. Stone walls are usually made of local materials varying from limestone and flint to granite and sandstone. Explanation: However, the quality of building stone varies greatly, both in its endurance to weathering, resistance to water penetration and in its ability to be worked into regular shapes before construction. Worked stone is usually known as ashlar, and is often used for corners in stone buildings. 13. English garden wall bond course of headers bond has three courses of stretchers between every course of stretcher. Explanation: For the standard English garden wall bond, headers are used as quoins for the middle stretching course in order to generate the lap, with queen closers as the penultimate brick at either end of the heading courses. A more complex set of quoins and queen closers is necessary to achieve the lap for a raking English garden wall bond. 14. Glued engineered wood products are manufactured by bonding together wood strands, veneers, lumber. Explanation: These products include glued laminated timber (glulam), wood structural panels (including plywood, oriented strand board and composite panels), laminated veneer lumber (LVL) and other structural composite lumber (SCL) products, parallel strand lumber, and I-joists. Approximately 100 million cubic meters of wood was consumed for this purpose in 1991. The trends suggest that particle board and fiber board will overtake plywood. 15. As a tree grows, lower branches often die, and their bases may become overgrown and enclosed by subsequent layers of trunk wood, forming a type of imperfection known as a excreta. Explanation: As a tree grows, lower branches often die, and their bases may become overgrown and enclosed by subsequent layers of trunk wood, forming a type of imperfection known as a knot. 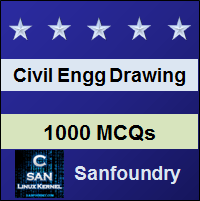 To practice all areas of Civil Engineering Drawing, here is complete set of 1000+ Multiple Choice Questions and Answers.